“Something’s happened.” My senses began to slowly emerge from deep sleep as I heard the faint sounds of Christmas carols. “Joel, something’s happened” I heard again but this time it registered. My father was waking up everyone on Christmas morning. My little brother began to stir in the bunk below. I jumped from the top bunk and met my brother and sister at the top of the stairs. We waited impatiently for our mother to leave the solace of a warm bed so we could see what Santa had brought us. After what seemed an eternity, mom finally arrived and we darted downstairs toward the Christmas tree. 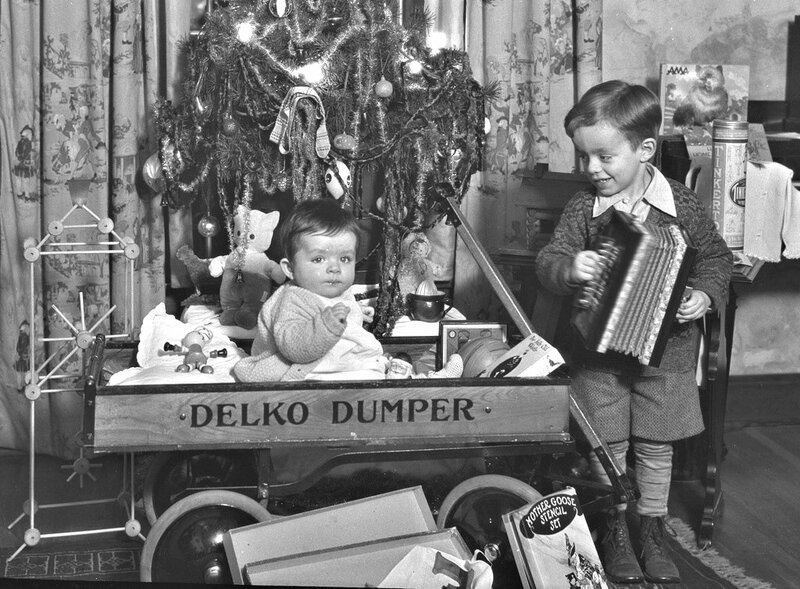 In those days, Santa left our unwrapped presents in little stations. The first order of the day was to identify which station was ours. My sister’s station was easy to spot with pink and clothes being the telltale signs. My little brother was next with an assortment of youngster toys. As the eldest, I expected a more mature set of gifts. After station identification, it was time to review each and every gift. I poured the contents of my stocking on the ground to find packs of Gushers and Hershey’s Kisses. My wooden shoes from Holland contained an assortment of nuts and two huge navel oranges. Next I spied a red leather-bound Bible with my name on the cover. Completing inventory, I surveyed what my siblings were up to. I helped my brother open some of his toys and watched my sister try on several new outfits. After a few minutes, my father asked, “Joel did you get everything you wanted this Christmas?” I must confess that it seemed like Santa had forgotten to leave a few presents at my station, but I answered, “Yes sir.” “I’m glad to hear it,” he replied. With that he headed into the TV room and motioned for me to follow. Dumbfounded, I joined him. I turned to face the TV and saw a Nintendo Entertainment System. I jumped up and down with glee and gave my father the biggest bear hug I could muster. For years, I had wished for a Nintendo and here it was. Fast-forward 25 years and Christmas looks a bit different. I am now married and my wife is just 2.5 weeks shy of delivering our firstborn. Our house has no tree, no lights or decorations. The living room is full of boxes but not the brightly wrapped kind. For two months we’ve been trying to move to a house with more room for our growing family, but delay after delay has kept us in limbo. I can empathize with how Joseph must have felt in the great Christmas story as he and a very pregnant Mary headed to Bethlehem for the census. The couple must have walked more slowly than the rest of the travelers on account of Mary’s great belly. Mary likely needed frequent rest and bathroom breaks. As the hours rolled by, Joseph became ever more aware of the slow progress they were making. He worried that Mary would have the strength to reach their destination. He worried that his child might arrive too soon. I imagine the couple arrived in Bethlehem long after dark to the unwelcomed news that there was no room available, save a stable. Joseph was no doubt excited about the new arrival, but also anxious about the future. He also likely felt the burden of not being able to house his new family in a more appropriate location. In spite of our predicament, Elaine and I will celebrate two births this Christmas, that of Jesus and that of our little child whom we affectionately call “Little One.” Our current living situation is definitely a step above a manger, but it is far from ideal. Just as the wrapping is quickly forgotten upon viewing the contents of a gift, I imagine Elaine and I will quickly forget about the imperfections of our situation as we first lay eyes on our newborn child. Merry Christmas and may this holiday season carry special significance as it will for us.